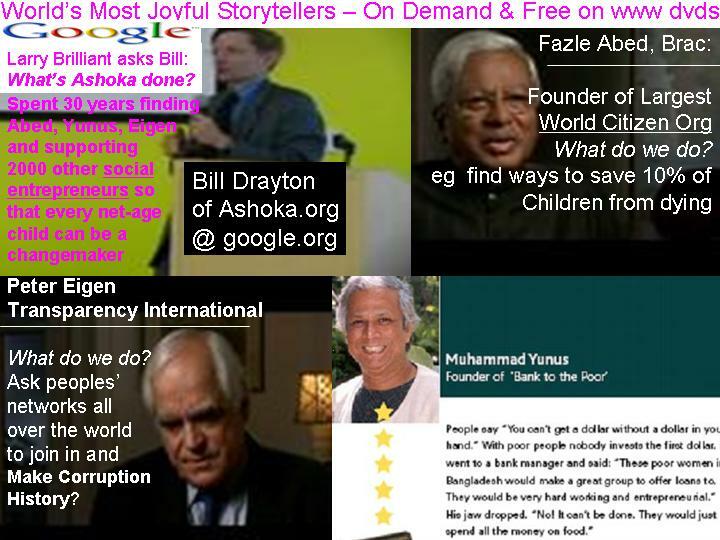 and then fall of 2008 ten thousand dvds of short video interviews made with Grameen leaders in summer 2008, then we celebrated Dr Yunus 69th birthday dialogue june 2009 - now is where presentations, and project exchnages between citizens get interesting and exponentially sustainable -read on and help connect citizens joy of life http://www.grameencreativelab.com/ across hemispheres and particularly across the three under-resourced halves of the world: womem, youth and the poor. .A team from around Europe travelled to Dhaka to spend a morning listening to Dr Yunus' 69th birthday wishes on priority uses of the world's greatest invention. He is searching the world for 4 particular kinds of partnership - each involves a benchmark club of leaders of world's most resourced organisations and how they can value partnering one of the world's most trusted grassrooots networks serving life critical needs. .Celebrate -or help - Yunus' progress -as he searches for leaders who want to benchmark for sustainability and help unite the human race in ending poverty. 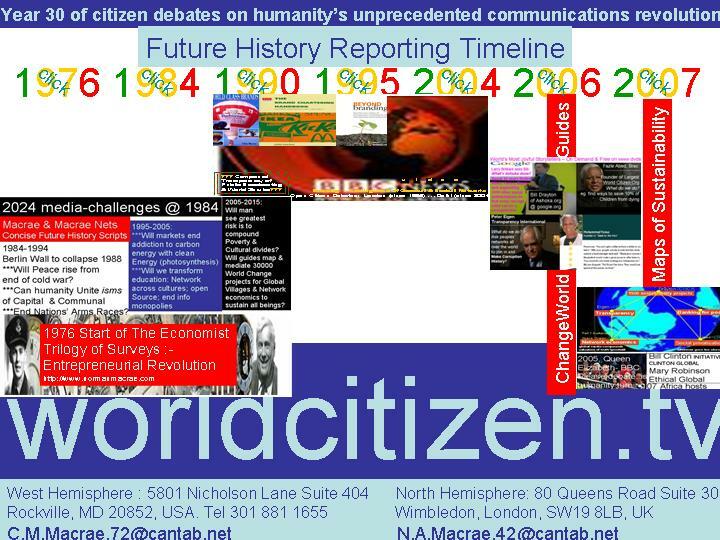 This is one of those "once in a lifetime" opportunities to co-create world citizen media -don't lurk now! "Thank You to Some of the Finest Citizens"
The men and women we honor today have led very different lives and pursued very different careers. They're pioneers in science and medicine. They're gifted artists and indomitable athletes. They have made their mark in the courtroom, in the community, and in Congress. And what unites them is a belief -- that most -- forgive me to those of you who are not Americans -- but what we consider to be that most American of beliefs -- that our lives are what we make of them; that no barriers of race, gender, or physical infirmity can restrain the human spirit; and that the truest test of a person's life is what we do for one another. The recipients of the Medal of Freedom did not set out to win this or any other award. They did not set out in pursuit of glory or fame or riches. Rather, they set out, guided by passion, committed to hard work, aided by persistence, often with few advantages but the gifts, grace, and good name God gave them. So, let them stand as an example here in the United States -- and around the world -- of what we can achieve in our own lives. Let them stand as an example of the difference we can make in the lives of others. Let each of their stories stand as an example of a life well lived. whose peers to trust most in the world as learning changes and must be more and more open? 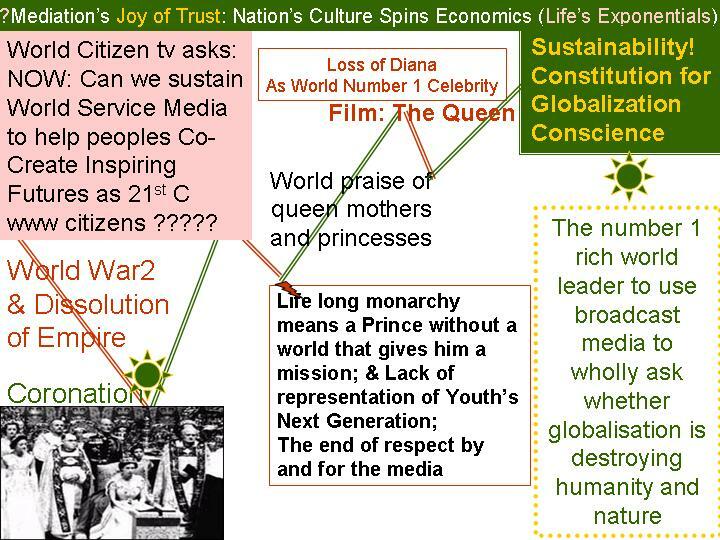 what replicable action projects can expoenentially sustain the planet and every community rising? 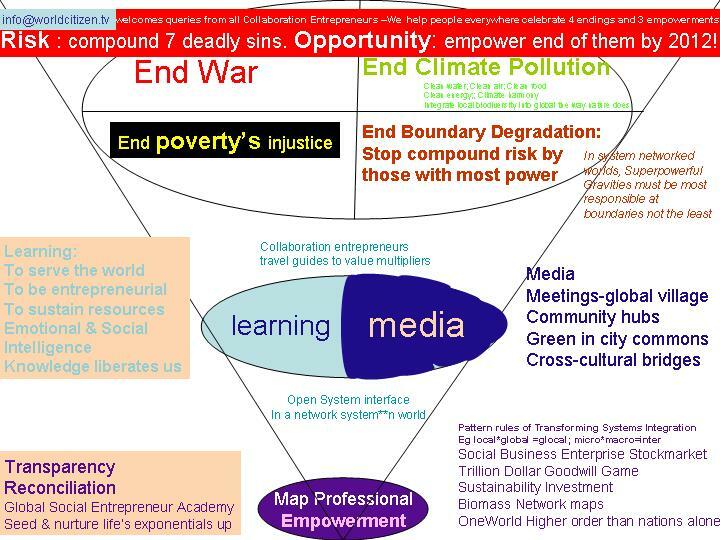 mapping which governance models multiply microentrepreneur energy and jobs that empower every human to make a win-win-win difference.? HEC Paris vient d’annoncer la création, à la rentrée prochaine, d'une chaire "Entreprise et pauvreté". Née d’un entretien entre le Président de la République Nicolas Sarkozy et le Prix Nobel de la paix Muhammad Yunus, cette initiative a pour enjeu de former des étudiants à des approches innovantes d’entreprises afin de contribuer à réduire la pauvreté. Grameen membership and ownership is over 97% female. This came about because women proved to be far more interested than men in sustainability investments in community. April 08 sees a courageous attempt in Washington DC to action the launch the largest Western collaboration of women's networks ever. We haven't seen this sort of thing work before but that's no reason why we shouldn't interface such a meta-network successfully one day -today!. At a virtual level, it comes back to everyone who wants to see women's ownership of world assets rise above today's 5% agreeing to link through one portal that is the most collaborative guide to where women are doing/investing what for community and planet sustainability. Of course, if someone like google's home page would offer that link for women, we might move on to a new world of women's sustainability investment mapmaking. 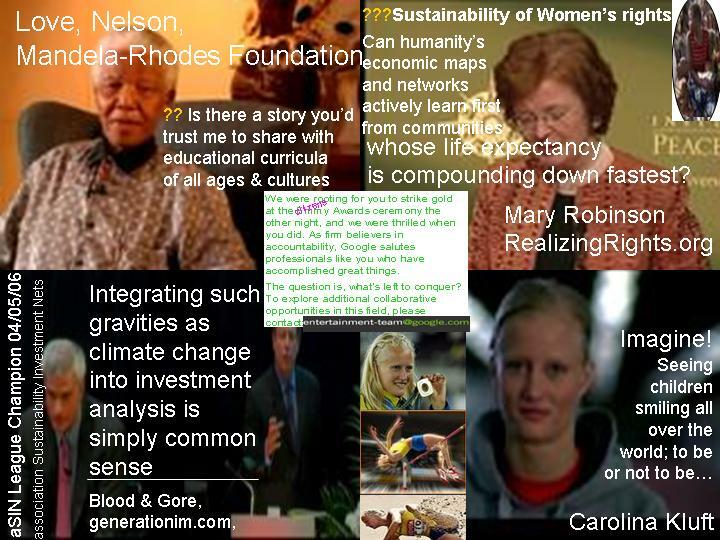 readers comments welcomed: eg who would like to be the first to apply JG's 24 year old review to my father's book http://www.normanmacrae.com/netfuture.html to Yunus' “I am more than willing to accept that were we to use science along the lines Norman Macrae suggests, we could transform the world”. 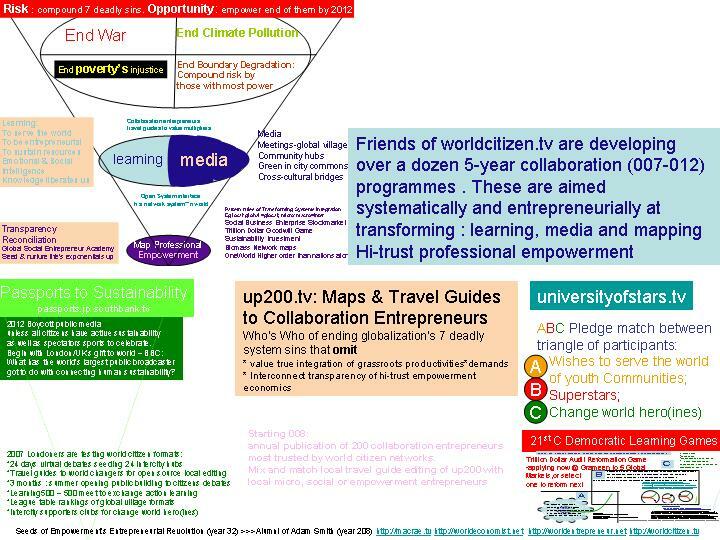 2 what uniquely do supporters networks collaborate around across cities and rural? 3 what's their next wish for unitintog citizens worldwide?